Chapter 1 describes the description format of UNL Expressions. Chapter 2 describes what relations and how they are selected, and what are the roles of relations in UNL. Chapter 3 describes what information attributes express in UNL, what kinds of attributes there are, and how they are decided. Chapter 4 describes how a concept is defined, how an UW for a concept is created, what kinds of UWs exist for expressing various meanings of natural languages, and how a compound concept (hyper node or scope) is expressed in UNL. Chapter 5 describes how the UNL Ontology is constructed, what information it provides and how, and what roles it plays in the UNL System. Chapter 6 and 7 describe how different levels of knowledge is considered and dealt with, and how logic expressions are expressed in UNL. Chapter 8 describes the architecture of the UNL System and conversion mechanism between UNL and natural languages. How to express it in UNL? This manual is meant to complement and clarify the UNL Specifications. A variety of examples from different languages are used to explain how each component mainly relation or attribute should be used, and how the UNL Expressions should be for various meanings. The manual is arranged and orgnaized according to grammatical phenomena of natural language. This manual consists of 6 chapters. 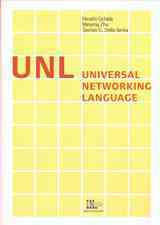 Chapter 1 explains the informational structure of UNL, how UNL deal with verious information of natural languages. Chapter 2 explains what kinds of UWs exist in UNL. Chapter 3 explains how UNL Expression should be for representing a sentence or a hyper node. Relations are explained in chapter 4, a comparison with closer relations is made to help to understand each relation. Attributes are explained in chapter 5, focusing on what kinds of attributes exist and how each is used using exampls of different languages. The last chapter 6 explains how various meanings or expressions of natural languages are dealt with in UNL. What is the structure of a UW? How to define a UW? These are the main questions we intend to clarify through this manual. It is meant to explain how to create and to define Universal Words. Through this manual, we hope not only to wide spread the knowledge on UNL, but also to reduce the number of wrong, inappropriate or redundant UWs. Specifications of UWs are defined in chapter 4 of UNL Specifications. This manual is intended to be a guide, for educational purposes, to explain how to understand, create and define a UW. For fully understanding this manual, the thorough study of UNL Specifications is of the utmost importance. The aim of UNL Annotation is to clarify semantic structures of sentences. The purpose is to generate meaning representations of UNL of sentences without using language dependent grammatical information. Tags for UNL Annotation are designed to be language independent. By inserting the tags in sentences of a natural language, UNL Expressions can be generated from the (any) language using the Universal Parser. This document provides definitions of tags for UNL Annotation and explains how each tag is used. For details see http://www.undl.org/unlsys/uparser/UNLA.pdf (1.0, 2003). Sentences annotated with tags of UNL Annotation are input of the Universal Parser. The Universal Parser is explained in the UNL System. Chapters 1 - 5 describe the specifications of the UNL and UNL Documents, chapters 6 - 7 describe how the UNL express various kinds of knowledge and the mechanism of reasoning using UNL expressions, and chapter 8 describes the structure of the UNL System and explains its components. Chapter 8 also explains how to create the UNL Encyclopedia and introduces some method to create UNL Documents. Information on how to get the book is provided at here. This book can be viewed at http://www.undl.org/publications/gm/index.htm. These slides are for educational purpose on the DeConverter. The following slides explain the function, the format or syntax of rule, the type of rule, the usage, etc. of the DeConverter, all knowledge that are necessary for using it. The following slides show examples. Each slide shows a step-by-step process (trace) of deconversion of a sentence. English DeCo rules (r.txt) deconversion rules that are necessary to deconvert the UNL of S:14 below. English dictionary entries (d.txt) dictionary entries that are necessary to deconvert the UNL of S:14 below. Text data of dictionary entries must be converted into IBAM formatted files using DicBld. 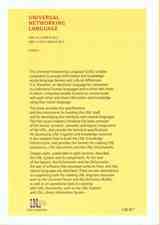 UNL of S:14 of artile "Ethics and Science" example of UNL that can be deconverted using the rules and dictionary entries above. Output deconversion result of English using above files. Dictionary entries dictionary entries that are necessary to deconvert the UNL of S:22 below. Text data of dictionary entries must be converted into IBAM formatted files using DicBld. UNL of S:22 of article “Ethics and Science” example of UNL that can be deconverted using the rules included in the deconversion process below and dictionary entries above. Deconversion process of S:22 is shown. This list of UNL Documents is provided in chronological order of when they are made. The newest is the last of the list.